Sixtyone Restaurant is tucked away in Marylebone, just off Marble Arch. It’s an elegant place with a cream and chocolate color scheme, well-spaced tables and comfortable furniture. Chef/patron Arnaud Stevens offers a contemporary European menu with some imaginative ingredients that work well together. Start with mussels, bread soup and pork belly; follow with pigeon with snails, cauliflower and parsley risotto or sea bream with carrots, walnuts and grapefruit. The restaurant is very good value with set lunch at 2 courses for £18 or 3 for £22 and à la carte prices follow with starters from £6 to £9 and mains £14 to £22. You can enter either from its official address (61 Upper Berkeley Street) or from the lobby of The Montcalm hotel. Lunch & Dinner Mon.-Sat., Sun. noon-5pm. Sixtyone Restaurant, 61 Upper Berkeley St., London W1H 7PP, 020-7958 3222. Following the opening of Mirror Room, the newly debuted Rosewood London has launched the Holborn Dining Room. Set in what was Jun Tanaka’s Pearl, it’s a much sexier space than the name “Dining Room” implies. Open all day, it’s the brainchild of Des McDonald and is a casual alternative, serving good old British dishes like a London particular (that’s a pea soup). It’s also a much-needed addition to a rather drab section of London, east of Kingsway. The Delicatessen offers takeaways and there’s an internal terrace for al fresco dining. Mon.-Fri. 7am-11.30pm, Sat. 8am-11.30pm, Sun. 8am-10.30pm. Holborn Dining Room & Delicatessen, 252 High Holborn, London WC1V 7EN, 020-7829 9888. Located in Shoreditch, east London, Bones comes courtesy of brothers Joss and Simeon Goodman who run The Grocery shop next door. The rotisserie takes center stage; otherwise it’s a mix of sharing dishes that include chickpeas and smoked morcilla with honey and paprika cured pork loin (£10); pan-fried salmon with fennel, capers, tomatoes and olives (£9); and Scottish and chorizo sourdough bruschetta with watercress (£8). You can wash it down with cocktails, beers and wine. Daily 7am to 1pm. Bones, 52 Kingsland Rd., London E2 8DP, 020-7033 9008. Nuno Mendes, former chef at Viajante, did not desert London. Instead, he’s running the restaurant, Chiltern Firehouse, at André Balazs' upcoming London hotel Chiltern Street. As the name implies, it’s in a former fire station, a handsome red brick building that is something of a London landmark. Chiltern Firehouse, Chiltern Street, 1 Chiltern St., London W1U 7PA, 020-7073 7676. Russell Norman is known for Polpo and for the first Polpetto, which was above the French House in Soho until its closure over a year ago. Now he’s reopened the new Polpetto, still the London equivalent of a Venetian bacaro (Italian tapas) bar with Florence Knight cooking dishes for sharing. The place looks good and as if it had been there forever, and the dishes are of the kind that can land you a large bill if you really push the boat out. But there's enough flexibility in the menu and enough fans to keep the place jumping. Mon.-Sat. noon-11pm, Sun. and Bank Holidays noon-4pm. 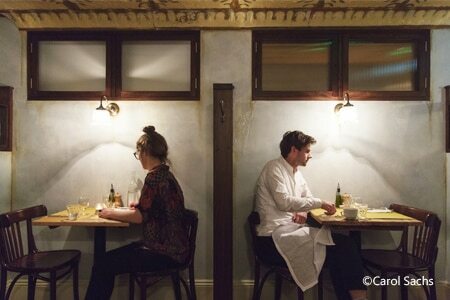 Polpetto, 11 Berwick St., London W1F 0PL, 020-7439 8627. Battersea on the south side of the river just below Chelsea is scheduled to be the next great area, so Gordon Ramsay has bought what used to be Bennett’s Brasserie & Oyster Bar and reopened it as London House. The new restaurant is suitably glamorous with several dining rooms where contemporary European dishes like pumpkin and pecan nut soup with toasted brioche to start and chicken with butter-roasted sweet potato and braised Puy lentils are served by a friendly, professional staff. Ramsay has a knack for spotting talent; chef Anna Haugh-Kelly is a name to watch. Lunch Fri.-Sun., Dinner Tues.-Sun. London House, 7-9 Battersea Square, London SW11 3RA, 020-7592 8545. The Big Easy in King’s Road has always been a favorite, so it’s great news that there’s a second one scheduled to open on March 17 in Covent Garden. It should be fun, and it’s certainly huge --- this outpost will have a theater-style kitchen, Argentinean-style parilla charcoal grills and a rotisserie. Oh, and live music, of course, just like its older brother in Chelsea. Big Easy Covent Garden, 12 Maiden Lane, London WC2E 7NA, no phone. Ever-popular Kensington Place has joined the growing passion for pop-up restaurants by installing FISHBone in what is usually the private dining room. It accommodates a cosy 36 guests intent on trying the “fast fish” dishes like a tuna burger or a prawnish pasty. It’s cheap and fast and fun and will last until March 31. Kensington Place, 201-209 Kensington Church St., London W8 7LX, 020-7727 3184. Chef Nuno Mendes left now-closed Viajante, the restaurant in Bethnal Green’s Town Hall Hotel. But do not despair, Jason Atherton is taking over and putting his chef Lee Westcott in charge. Westcott is executive chef of Atherton’s restaurants in Hong Kong and he’s worked with Gordon Ramsay at Claridge’s as well as the recently closed restaurant Tom Aikens in Chelsea. Town Hall Hotel & Apartments, Patriot Sq., London E2 9NF, 020-7871 0460.